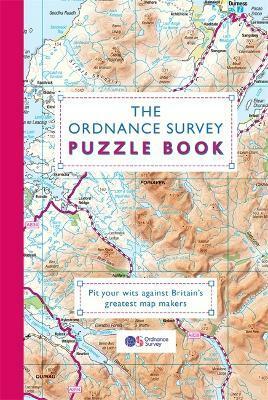 The Ordnance Survey Puzzle Book was 2018's bestselling Christmas gift book so why not brush up on your map reading skills and crack an array of fiendish puzzles all whilst learning amazing facts so YOU can become the ultimate map-reader! Do you know your trig points from your National Trails? Can you calculate using contours? And can you fathom exactly how far the footpath is from the free house? Track down hidden treasures, decipher geographical details and discover amazing facts as you work through this unique puzzle book based on 40 of the Ordnance Survey's best British maps. Explore the first ever OS map made in 1801, unearth the history of curious place names, encounter abandoned Medieval villages and search the site of the first tarmac road in the world. With hundreds of puzzles ranging from easy to mind-boggling, this mix of navigational tests, word games, code-crackers, anagrams and mathematical conundrums will put your friends and family through their paces on the path to becoming the ultimate map-master! Established in 1791, Ordnance Survey is the world's leading producer of maps. Their vast collection of geographic data has mapped the location of every fixed physical object in Great Britain, from the ground upwards, to within one metre accuracy. While their world-famous and much-loved paper maps remain important, OS produce digital map data, online route planning and sharing services and mobile apps, plus many other location-based products so you know exactly where you are.